Learning tags are like labels or keywords that you can attach to learning stories. They generally relate to elements of your curriculum, outcomes, goals, dispositions, schemas, values, culture, interests or subjects. You can add your own tags to a story or add existing tags. Each tag consists of a tag name and an optional description. The tags you attach appear to the right of each published story. The optional description, which might be your own words or a website link is visible when a user clicks on a tag attached to the story. They let you ‘tag’ and explain an aspect of a story that relates to a specific learning outcome or strand of your curriculum (eg. Te Whāriki, Early Years, International Baccalaureate etc). They give teachers quick access to curriculum resources so writing rich learning stories takes less time. They deepen parents’ and family members’ understanding of how a child’s behaviour within a story relates to learning outcomes or the curriculum. Adding learning tags to your stories lets you group stories since you can filter or search for the learning tag and view all the stories that contain it. This enables you to track learning over time. On an early learning service’s page you might, for example, filter stories by the tag ‘Written literacy’ to show all children’s stories that have been tagged with ‘Written literacy’. On a child’s page you might, for example, filter stories by the tag ‘Relating to others’ and see how a child develops in his/her relationship with others over time. On a teacher’s profile page you might, for example, want to see a list of the tags that have been used in that teacher’s past stories so you can see where any gaps are and develop capability in future stories. 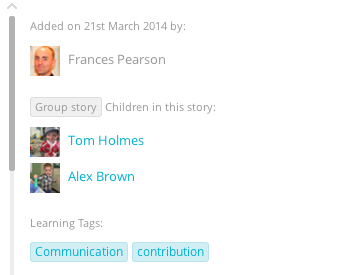 Add learning tags to a story directly within the story editor. 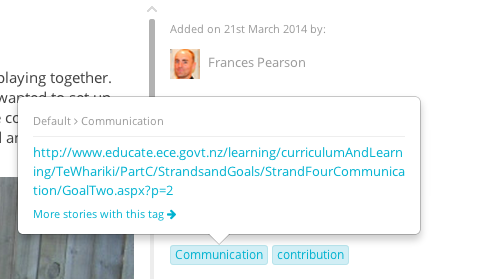 Manage your learning tags and sets within your early learning service’s ‘Learning sets’ page. Learning sets are simply a collection of learning tags, organised within folders. You can use or adapt an existing ‘public’ learning set or create your own private learning set within your early learning service’s ‘Learning sets’ page. Once you’ve created, added or adapted one or more learning sets, you and your team will be able to create stories using the learning tags within that set. Learn how to create learning sets and tags.